Download "Living benefits. Oasis. 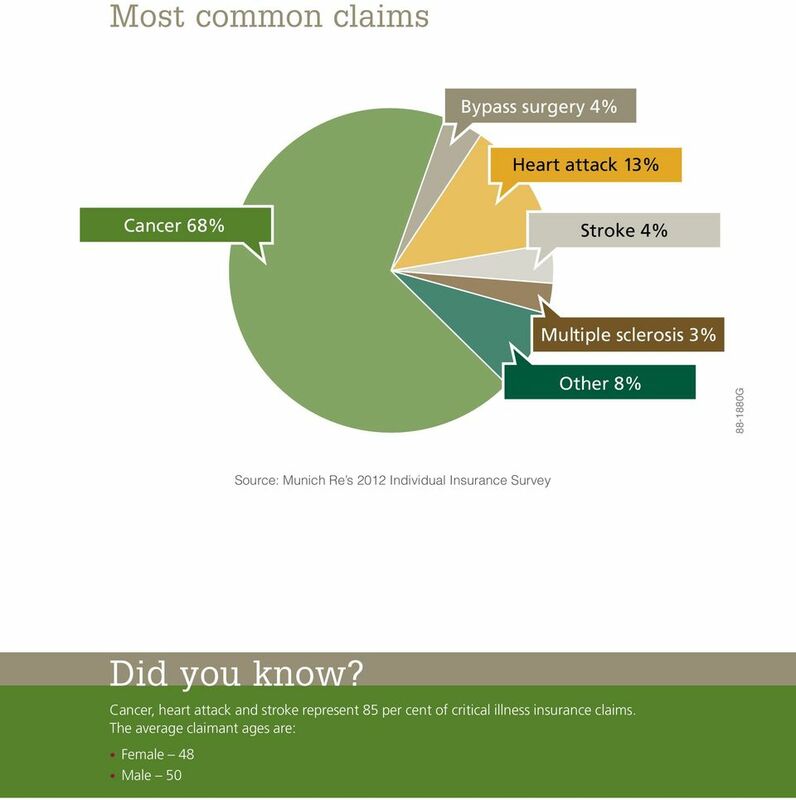 A look at critical illness insurance claims"
2 People are living longer. If you experience a critical illness, you re now more likely to survive it and live for many years. That s the good news. The bad news is, if you don t have critical illness insurance protection, you may not have the financial means to continue with your family s current lifestyle following your recovery. Fortunately, Great-West Life offers critical illness insurance, making sure you have a plan in place to help reduce financial stress if you survive a critical illness as defined in the policy. No one wants to think they ll be diagnosed with a critical illness in their lifetime, but consider these statistics: Heart disease One in two men and one in three women will develop heart disease in their lifetime. 80 per cent of hospitalized heart attack patients survive the event. Cancer One in 2.2 men and one in 2.4 women living in Canada will develop cancer during their lifetime. The likelihood of Canadians with cancer surviving five years is 63 per cent. Stroke There are an estimated 50,000 strokes in Canada each year. That s one stroke every 10 minutes. 85 per cent of stroke patients survive the initial event. Sources: Heart and Stroke Foundation of Canada (2009); Canadian Cancer Statistics 2013, Hakim, Silver, & Hodgson, 1998 The statistics provided in this brochure have been developed by the identified sources and are not based on the definitions of critical illnesses contained in the Oasis TM policy. They are provided for general information only. Are you prepared? A long-term critical illness can affect your family life, your ability to work, and your future, well beyond recovery. 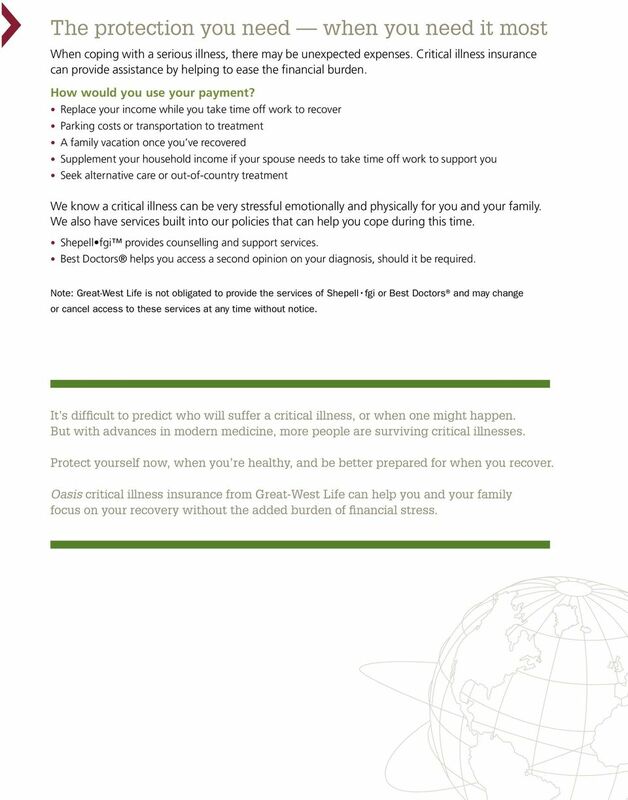 Purchasing critical illness insurance from Great-West Life can help cover financial expenses that often arise when an unforeseen illness occurs. We want you and your family to be prepared if you re diagnosed with a critical illness. 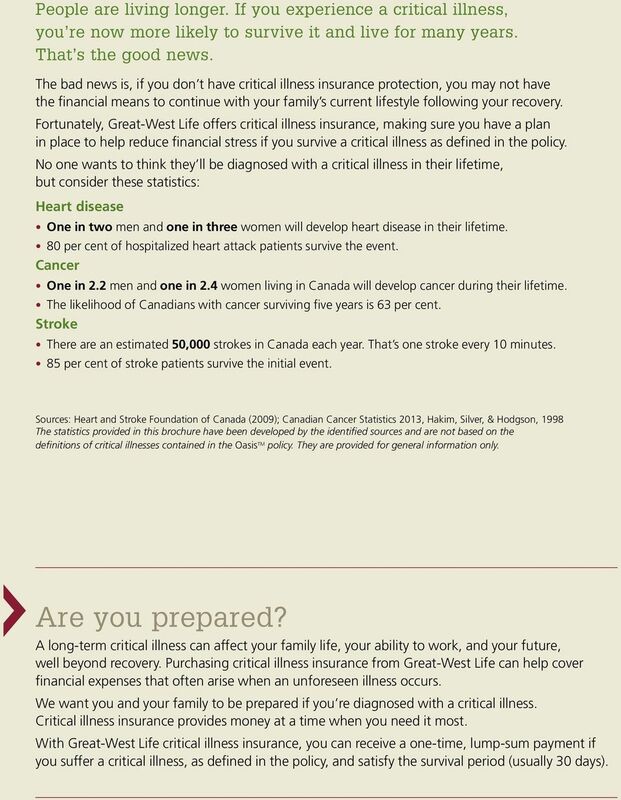 Critical illness insurance provides money at a time when you need it most. With Great-West Life critical illness insurance, you can receive a one-time, lump-sum payment if you suffer a critical illness, as defined in the policy, and satisfy the survival period (usually 30 days). 4 Great-West Life paid out $10 million in claims in Serious, life-changing illnesses can sometimes be random. You may not think a critical illness will happen to you, but it can happen to anyone, at any age. 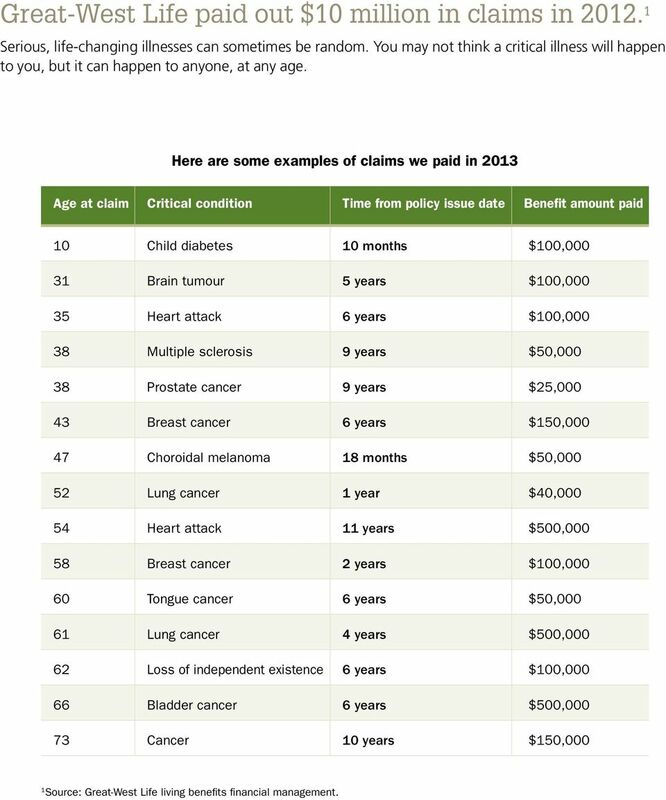 Here are some examples of claims we paid in 2013 Age at claim Critical condition Time from policy issue date Benefit amount paid 10 Child diabetes 10 months $100, Brain tumour 5 years $100, Heart attack 6 years $100, Multiple sclerosis 9 years $50, Prostate cancer 9 years $25, Breast cancer 6 years $150, Choroidal melanoma 18 months $50, Lung cancer 1 year $40, Heart attack 11 years $500, Breast cancer 2 years $100, Tongue cancer 6 years $50, Lung cancer 4 years $500, Loss of independent existence 6 years $100, Bladder cancer 6 years $500, Cancer 10 years $150,000 1 Source: Great-West Life living benefits financial management. 5 The protection you need when you need it most When coping with a serious illness, there may be unexpected expenses. Critical illness insurance can provide assistance by helping to ease the financial burden. How would you use your payment? Replace your income while you take time off work to recover Parking costs or transportation to treatment A family vacation once you ve recovered Supplement your household income if your spouse needs to take time off work to support you Seek alternative care or out-of-country treatment We know a critical illness can be very stressful emotionally and physically for you and your family. We also have services built into our policies that can help you cope during this time. Shepell fgi provides counselling and support services. Best Doctors helps you access a second opinion on your diagnosis, should it be required. Note: Great-West Life is not obligated to provide the services of Shepell fgi or Best Doctors and may change or cancel access to these services at any time without notice. It s difficult to predict who will suffer a critical illness, or when one might happen. But with advances in modern medicine, more people are surviving critical illnesses. Protect yourself now, when you re healthy, and be better prepared for when you recover. 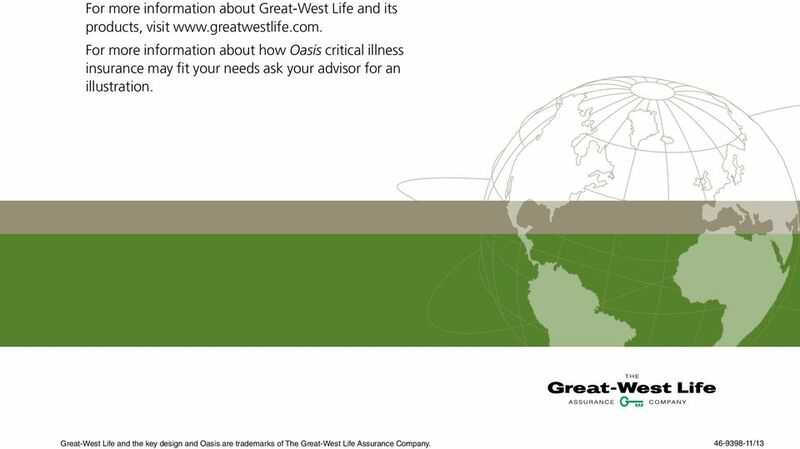 Oasis critical illness insurance from Great-West Life can help you and your family focus on your recovery without the added burden of financial stress. The services I provide my clients FOUR CORNERSTONES OF FINANCIAL SECURITY Liquidity Wealth creation and management Living Benefits Retirement Wealth protection Estate Planning What is a critical illness? Critical Illness Insurance What is Critical Illness Insurance Whereas life insurance has been readily available for literally hundreds of years, critical illness insurance is a relatively recent development. CRITICAL ILLNESS COVER IF LIFE WERE TO CHANGE overnight due to a critical illness, and you had to stop working to focus on your health, have you thought about what financial support you have in place? vital link Critical Illness Insurance It s about living your life Your guide to Critical Illness Insurance You really feel like you re on the right track. Your life seems to be going just as you planned. If I were no longer around, who would pay my mortgage? Make your wellness a priority with Living Benefit Assistance Services. Accelerated Protection. Do I need Critical Illness insurance? You ve protected your family s financial future by purchasing life and health insurance. Critical Illness Insurance It s cash when you need it. You choose how to spend it. So you can focus on getting well. ARE YOU PREPARED FOR A SERIOUS ILLNESS? WHAT IS LIVING ASSURANCE? WHAT DOES IT OFFER ME? ARE YOU PREPARED FOR A SERIOUS ILLNESS? It s a fact of life that we all get sick, and sometimes seriously. The cost of recovery from an illness like cancer or from a heart attack can have a huge impact. FACT SHEET. Critical Illness Insurance. What is Critical Illness Insurance? How Much Critical Illness Insurance Do I Need? 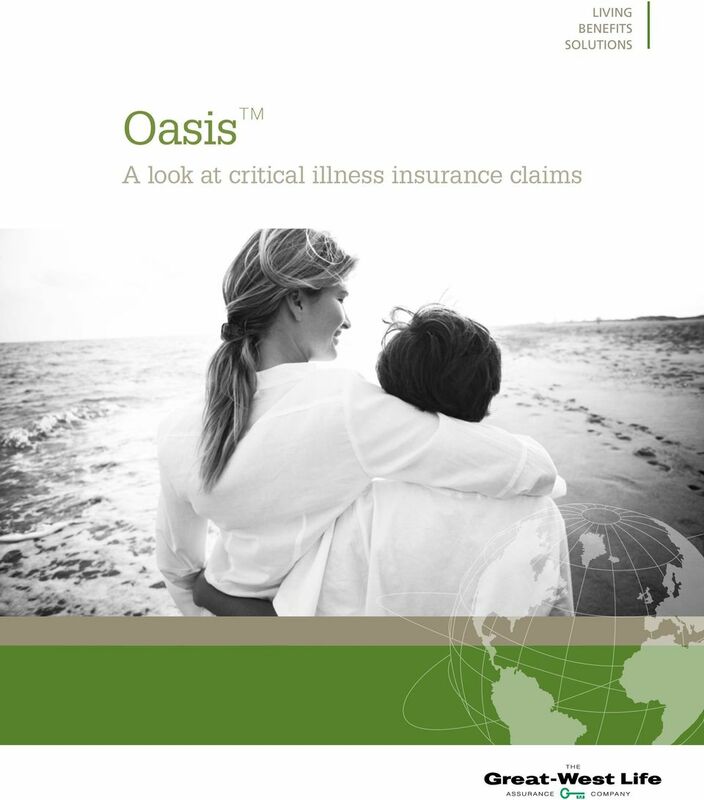 Critical illness cover. It s about time. CRITICAL ILLNESS PLAN. Ease the financial burden due to a critical illness. Individual Income Protection. When you protect your income, you protect what matters most. Mortgage protection and your money back! What c. a criticaith. to you?